It struck me last night, as I washed all the dishes, how needlessly wonderful it is that teapots exist. I mean, they have a purpose, sure. They’re supposed to hold hot water as the tea leaves steep and stain the liquid for us. But, when I was a kid, my mom would sometimes brew tea in a glass measuring cup, teabag-tags hanging over the side of the cup where one-two-three-four cups of water were counted out. So, there really is no need for a teapot. One could also make a case that teapots exist to transport the liquid. But, I could have transported just the same in the stainless-steel pot I boiled the water in–the pot my mother received as a wedding gift over thirty years ago–held between potholders as I walk outside to my friends gathered around the backyard picnic table and tea lights. Instead, though, I poured the boiling-hot water into the vessel I keep on the high-shelf, above the refrigerator. 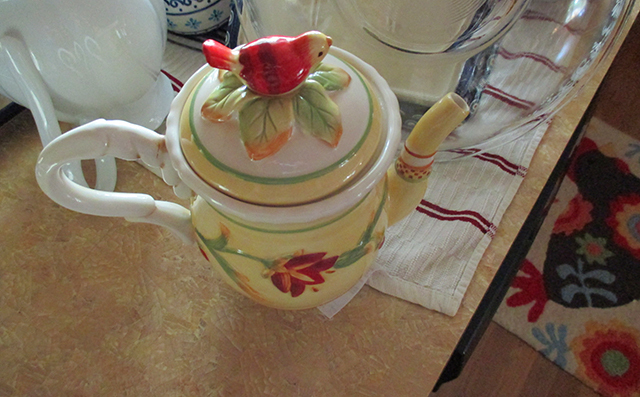 One of the teapots I used last night has a tiny, red bird on the lid, popping out with her jaunty tail. There is no reason or need for this extravagant show–it’s just an addition of beauty. My other teapot is all-white, but with elegant scrolling designs. For no reason. Only this: beauty. Maybe there is no pressing necessity for decoration, but I feel like, in some way, it says this: life can be rough. But, we will gather together with lovely things and purposeful dedication to making life brighter. And so, we have teapots. And when I washed mine out last night, after a good time with friends and fireflies, I looked at them and smiled. Texts-from-friends, “What should I bring?”; and the graphic designer who penned astounding labels for our simple cheeses; and fresh daisies brought by one; another slipping veggies to my piggies…and teapots. Sometimes it’s the simple things that remind you that the world still has beauty in it. After midnight, when I finished washing the dishes, I knelt on the loveseat, face to the open window. The summer night-breeze and the memories of the evening all there in front of me and I thought: well, this is just living, isn’t it? Some of theeeeee beautiful people. 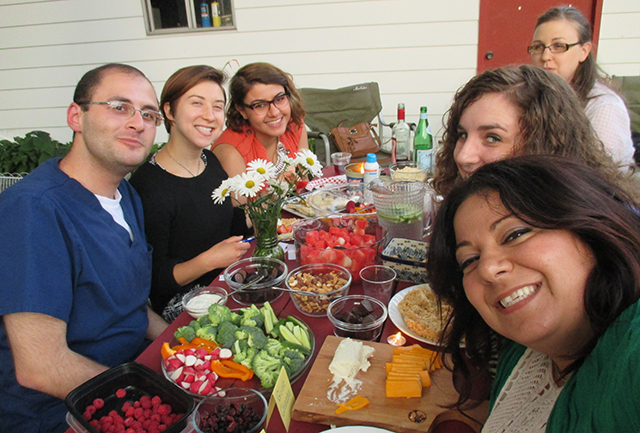 Love how you turned your week around with a party. And I have a thing for teapots and a goal to drink tea more when I grow up, so that my love for tea pots can make more sense.